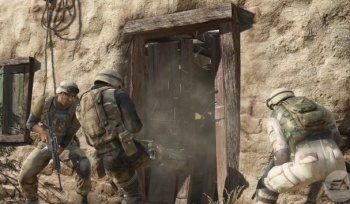 Medal of Honor "Won't Necessarily Push the Genre Forward"
Medal of Honor Executive Producer Greg Goodrich says EA is working hard to make the game a great experience, but cautions that players who expect it to "revolutionize the genre" might be disappointed. "Not necessarily pushing the genre forward" sounds like the sort of thing you'd hear a game-maker say about a competing product, but in this case, Goodrich is talking about his own baby: The new Medal of Honor, currently being developed by EA Los Angeles. He said the studio is more interested in making it the best, most refined game possible, rather than redefining the entire FPS genre. "What we're focusing on is making a great first-person shooter," Goodrich told Destructoid. "[If we don't make a game] that revolutionizes the genre, so be it, but we're showing up to do a great game - a great experience that fans will love." "At the end of the day, it's all about making a great shooter, and not necessarily pushing the genre forward," he added. Comparisons with the genre-dominating Modern Warfare games are inevitable, but Goodrich seemed comfortable with the idea of going head-to-head with the biggest shooter franchise in the industry. "Nowadays, especially in the shooter genre, if you show up to the table, you have to show up with quality - you have to show up with a product that's meant to be at the forefront of this genre," he said. "Because if you show up with a product that's not of quality, you might as well just not show up - there's no point." Medal of Honor is currently scheduled for release in fall of this year for the PC, PlayStation 3 and Xbox 360.